I take it that “political” means “for ideological reasons”, which could be interpreted as “for hate crime reasons”. Words are important in the law, so you have to be careful not to be sloppy with their meaning. People get sloppy with the word “political” and use it to refer to interpersonal influence (“office politics”), or beliefs (prejudice, philosophy), or even polite behavior (many uses of “politically correct”). But if you were writing a law about such things you wouldn’t want to use the word “political” to describe them, because people would think the law was about government acts & policies rather than personal or organizational ones, instead of what you were really talking about. Actually, “Politically correct” is more like what you said before concerning overcriminalization, where something is made illegal to compel society in a particular direction. Certain terminology is correct in order to comply with those strict liability statutes and regulations, especially around colleges. Sometimes “politically correct” has to do with holding or espousing a certain ideology. At other times it means not doing things that might offend or discomfort some category of person, which has more to do with mores of politeness. Sometimes it’s a sincere ethic, sometimes it’s a manipulative technique in the service of lofty goals, and often enough it’s a mere cynical tool for shouting down and punishing dissenting voices. The term is used for lots of different things. Wow, the 3rd criteria for murder 2 looks kinda crazy. For example Bill and Ted rob a bank and get out of the bank without hurting anyone. Even if Bill and Ted merely used their bare hands to coerce the money from the bank they posed a risk of physical danger to tellers and patrons.During the ensuing car chase with police, 6 year old Suzy is accidentally hit by a police car and killed. According to Fremont’s laws, because Suzy was killed by police “attempting to prevent the crime or flight therefrom” Bill and Ted are guilty of Murder 2…. and they went nowhere near her and were only tenuously responsible for police hitting the poor girl. 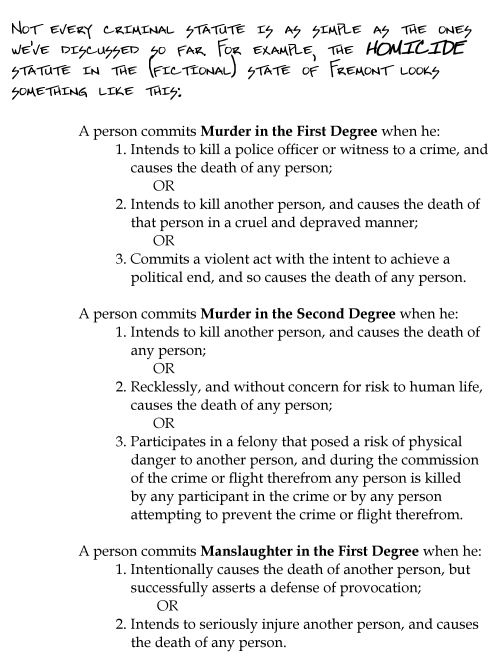 If I hit Johnny in the head with the intent of “teaching him a lesson”, but he dies, then that is Manslaughter 1, *but* it’s also (probably) felony assault, during which a person died, causing it to be Murder 2. Criteria 3 of murder 2 is often termed “felony murder.”. It’s covered more in the conspiracy section of the comic. The ensuing car chase is the key. Fleeing the bank with the cops in hot pursuit is knowingly creating a dangerous situation. Your reckless driving (or that of your getaway driver) may not have directly caused Suzy’s death, but that’s irrelevant. Bill and Ted’s actions both in robbing the bank, and their attempted escape resulted in Suzy’s death, and they will be charged with 2nd degree murder as a result. In some (real) states, Bill and Ted could get hit with murder 1 (yes 1, not 2) for what you described. Since their actions in the car chase likely showed “reckless indifference to human life”, and the death occurred because they intentionally committed a major felony, they could potentially face the death penalty for Suzy’s murder, depending on what state they’re in. Dhamon, so you want the cop to go to prison for Suzy’s death? Or drive calmly and at the speed limit and therefore lose the chase? The wording of the felony murder one is curious. The victim must have been killed by the perp or someone trying to stop him? So if I was robbing a store, and one of the customers panicked and ran out into traffic and was killed, I wouldn’t be liable? In this scenario, I didn’t kill them, and the motorist who did wasn’t trying to stop my crime.